The clash between what the Mormon Church teaches and what some Mormons think it teaches can be a curious thing to observe. Case in point: "Richard from London" called my Open Line radio show last week to berate me for my critical comments on an earlier show regarding Mormon theology. Richard identified himself as a former Catholic who converted to the Mormon Church, largely, he said, due to the many "disturbing" chapters in Catholic history. I pointed out that, whatever good or bad things Catholics have done over the centuries (and, to be sure, there are innumerable examples of Catholics doing both), none of it is at all relevant to the truth claims made by the Mormon Church. Once of those claims which the Mormon Church has made (one which, understandably, Richard denied), through the teachings of Joseph Smith and Brigham Young, as well as official LDS scripture, is that God "cursed" certain people by changing their skin color from white to black and, in some cases, brown — an issue I had discussed with a different caller on an earlier show. Take a listen and see what you think. As for the question about racism in the doctrines and practices of the Mormon Church, your indignant comments fly in the face of the facts. For the last century and a half the Mormon Church has preached a message of racial inequality based on the theory that God has "cursed" certain people with dark skin. As you well know, this curse applies both to blacks and those of "Lamanite" descent, although for different reasons. 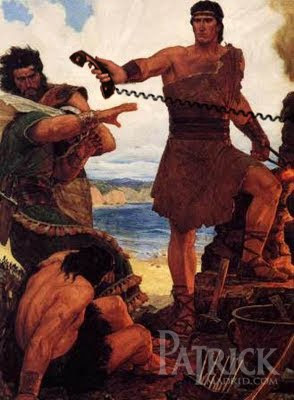 To make my point I'll focus just on the Lamanites. THE BOOK of Mormon says God "cursed" the Lamanites (whom Joseph Smith alleged were originally white-skinned Palestinian Jews from the family of Laman, son of Lehi, who settled in the New World around the year 600 B.C.) in retaliation for their sins by turning them into Indians with dark skin and hair (1 Nephi 12:23; 2 Nephi 5:21-24; Jacob 3:3-5; Alma 3:6; Mormon 5:15). The Mormon Church teaches that the Lamanites were the forerunners of North American Indians as well as of Mexicans and other Latin Americans. These are described in the Book of Mormon in unflattering terms: "dark," "filthy," "abominable," "loathsome," "idle," "wicked," "sorely cursed with skins of darkness," and "beyond the description of that which hath ever been amongst us." If this weren't enough to demonstrate that the Church of Jesus Christ of Latter-Day Saints teaches that certain races are inferior because of the color of their skin (isn't that the definition of racism? ), please recall that the Book of Mormon repeatedly emphasizes the notion that white skin is "pure and delightsome" and that brown skin is "filthy and loathsome." TO BE FAIR, I should mention that the Mormon Church does hold out hope to Indians, Mexicans, and all those who have been tainted by the Lamanite curse. The Book of Mormon explains that "Lamanitish" people who accept the Mormon gospel can hope to have their skins turned white. In Jacob 3:8 the white-skinned Nephites are warned about the wages of sin: "O my brethren, I fear that unless ye shall repent of your sins that their [the Lamanites'] skins will be whiter than yours, when ye shall be brought with them before the throne of God." If you need more convincing about this issue see also 3 Nephi 2:15, 2 Nephi 30:6, and Alma 23:18. Notice that I quote from the Book of Mormon--I'm not sneaking in "obscure comments," although I could have quoted zillions of 'em, and you know it, from "obscure" Mormon leaders such as the prophets Joseph Smith and Brigham Young, plus Bruce R. McConkie and Mark E. Peterson, both former members of the Quorum of the Twelve Apostles.